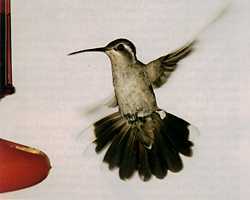 Average weight: male 8.4 g, female 6.8 g. This is a large hummingbird. Adult male: Green back and crown, dark gray breast, bright blue gorget, dark blue tail with white outer tips. Thin white stripes above and below the eyes. 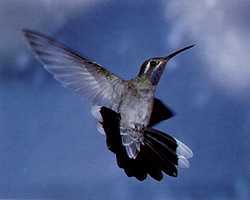 Adult female: Green back and crown, gray breast, white tips on outer tail feathers. Thin white stripes above and below the eyes. bserved in Arizona, California, Colorado, Louisiana, New Mexico, South Carolina, Texas, and Utah. Winters in Mexico.